Epicor is a Global ERP solution sold and supported in 150 countries and available in 30 different languages. Epicor is a single end –to-end software solutions available on premise, hosted, or in the cloud as a software as a service (SaaS) and is built on 100% Microsoft technology for greater access and mobile access for sales and field employees. 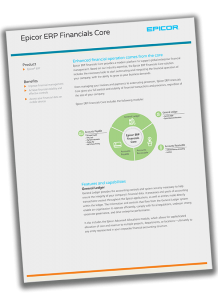 Epicor next-generation ERP represents a new breed of solution – one that was built to comply with the requirements of the world’s major markets through a configurable and engine approach and adaptable business architecture right from the beginning. Would you like to setup a meeting to discuss your ERP needs? It’s time to look closely at your manufacturing processes, internal efficiencies and silos of information so you can streamline and grow your business. You need to be able to adapt to new manufacturing methods, changing customer requirements and evolving business strategies. 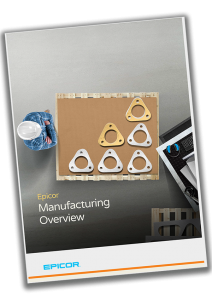 Epicor Manufacturing is a powerful, yet easy to use, manufacturing solution available to manufacturers worldwide. It’s fully integrated and loaded with innovative tools to synchronize supply, demand, and fulfilment as a means to reach new, industry-leading levels of business performance. For food and beverage manufacturers traceability is vitally important as well as operational efficiency. Today, it’s not enough to know who you purchased your raw materials from and what the next step is for your product. Manufacturers must arm themselves with the right tools, processes, and insight to uncover and report every element along the supply chain—from origin, all the way to the shelf or plate. And, the cost of all this insight can’t be a barrier to enterprise financial success. Read our whitepaper on the four essential things to know about Food and beverage tracking. Epicor Financial Management offers a refreshing new approach to business, a suite of accounting applications built for the highly regulated and increasingly global business world. Built around a series of “global engines “that support effective financial management and control anywhere. Our goal is to help every business achieve sound financial management and control, from a single general ledger to the extended global enterprise, efficiently. Epicor Financial Management gives you access to real–time fiscal information and provides the modern platform you need to support business around the world. Distribution businesses face many challenges in today’s highly competitive landscape. They need to ensure that all their resources and operations are optimally aligned with demand, so the need to have access to critical information so they can scale their operation accordingly becomes imperative. Access to information so they can determine redundant and slow moving inventory so they can make good purchasing decisions and be proactive as opposed to reactive in their Inventory procurement. 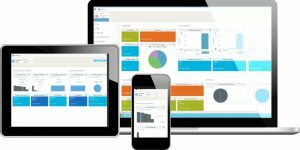 Epicor ERP Operations includes key functionality to help you transform the way you run your business. Offering a solid foundation, it enables you to streamline the most important processes of your operation—from processing your orders and managing inventory, to successfully fulfilling your customer demands. Keeping and growing your customer base should be the most important function of any business. Enhancing the total customer experience is the goal of any CRM program and this experience is delivered across various touch points eg. Physical store, online or phone by employees across the organization. Front-end (sales and service) employees interact directly with customers while back-end (IT, finance, operations) employees collect data, analyze it, and implement effective marketing and customer service campaigns. The ultimate intention of implementing a CRM system is to drive revenue and increase profitability. Customer relationship management (CRM) strategies are as important to business today as they have ever been. 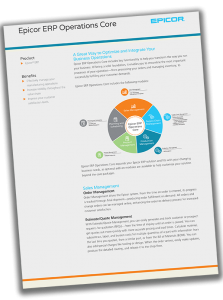 Epicor CRM is designed to help you stay ahead of the curve and successfully meet the challenges that the market brings—helping you effectively manage your entire customer lifecycle from prospect to cash to care, improve operational efficiency and accelerate growth—both internally and externally. CRM controls every aspect of a company’s interaction with its customers and potential customers from generating the lead, developing the opportunity, taking the order, producing and shipping or supplying the goods or services, getting the cash and supporting the customer. 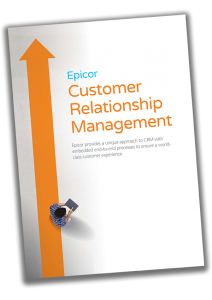 Epicor CRM provides a 360-degree view of the entire customer, supplier, or partner relationship. Epicor CRM broadens the scope of customer information to everyone within and across the organization and to stakeholders beyond.